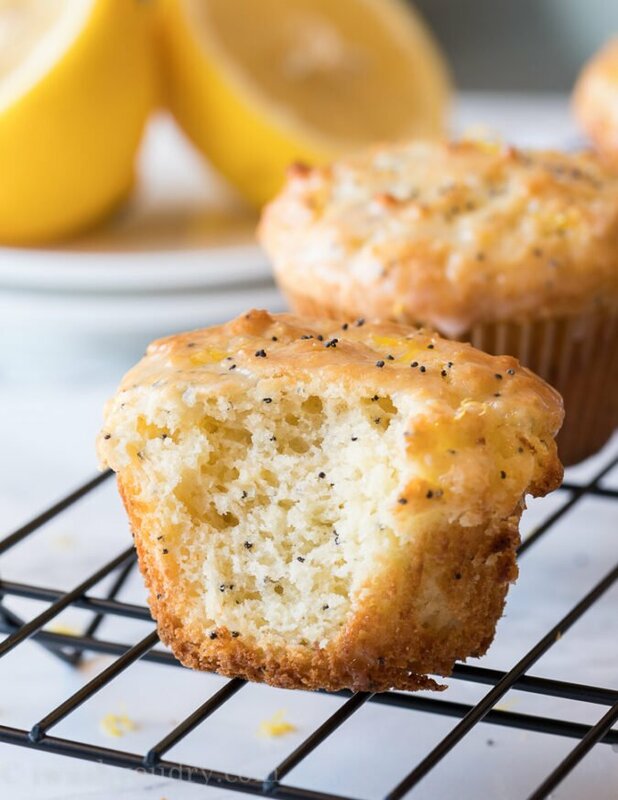 These super easy Lemon Poppy Seed Muffins are tender and moist for days with a sweet lemon glaze on top. At first he was obsessed with buying antique copper. Any sort of copper, really. I remember spending my weekends scouring the antique malls with my family looking for the best “copper find,” so I could win the prize. I can’t even remember what the prize was. Then his obsession turned to sports memorabilia. Before we knew it, my brother’s room was filled, wall to wall, with signed baseballs, autographed pictures, and framed jerseys. The sports memorabilia turned into golf antiques, and I guess that one has stuck with him over the years. So what does all this have to do with Lemon Poppy Seed Muffins, you ask?? I just wanted to share that information with you, so when I get into my food obsessions you’ll understand why I share 3 pie recipes in one week. And then make 16 batches of muffins the next week. These muffins are extra moist thanks to the greek yogurt in them. Try switching up the flavors of greek yogurt for other flavor variations. Add a tsp of almond extract for another fun flavor twist! 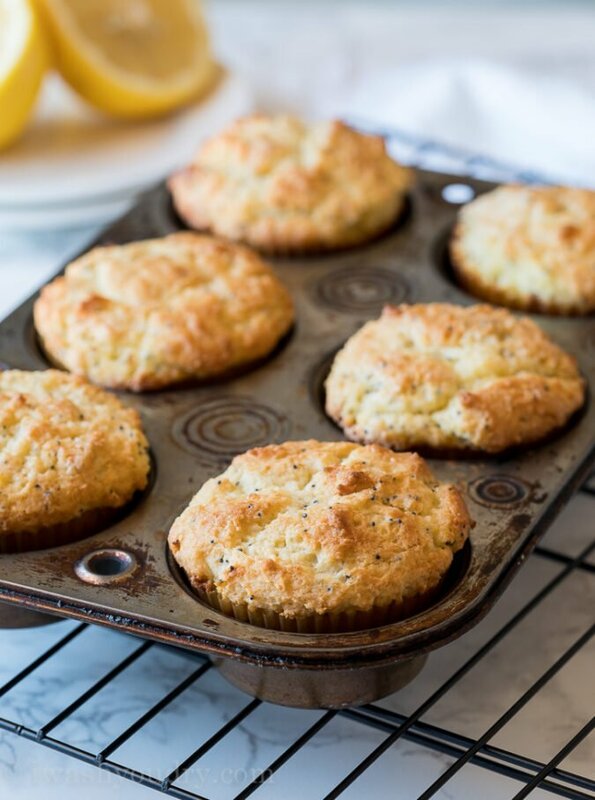 These Lemon Poppy Seed Muffins are deliciously light and moist on the inside, and bake up nice and tall like a bakery style muffin. I made a simple lemon and powdered sugar glaze to go on top too. 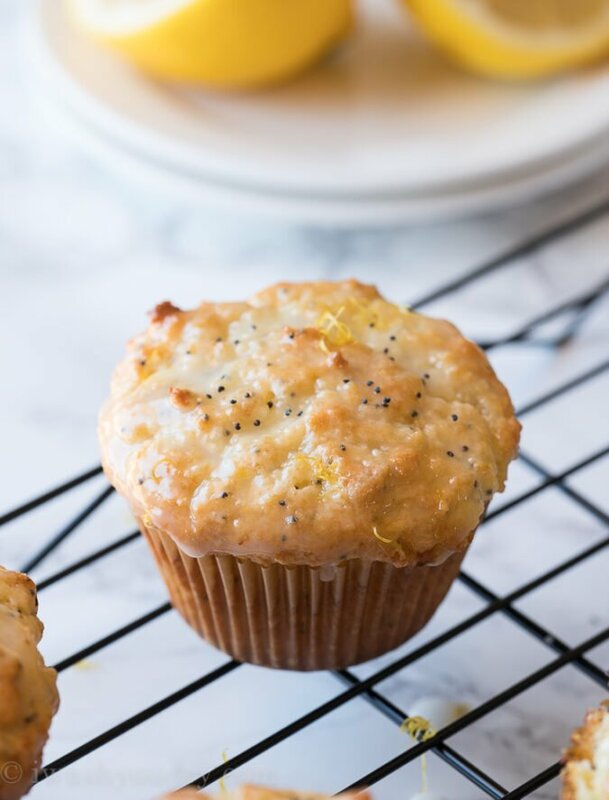 Basically, these Lemon Poppy Seed Muffins are exactly what you would expect out of a Lemon Poppy Seed Muffin. Addicting. 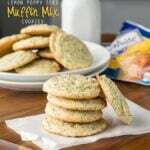 Make a batch of these super moist muffins for the family and watch how quickly they disappear! In a large mixing bowl, fit with the whisk attachment, beat the butter and sugar until light and fluffy. Add one egg at a time, scraping sides of bowl if necessary. Add the lemon zest, 2 1/2 tbsp lemon juice, and vanilla extract, continue to beat until smooth. In a separate bowl whisk together the flour, baking powder, baking soda and salt. 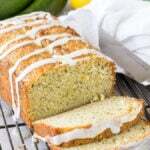 Alternately add 1 cup of the flour mixture, greek yogurt, and sour cream to the wet ingredients, until all the flour is used. Don’t over mix. Add the poppy seeds and stir to evenly incorporate. Divide the batter evenly among the lined muffin cups. Bake for 20-25 minutes or until muffins are lightly golden brown on top. Remove from oven and let cool on wire rack. 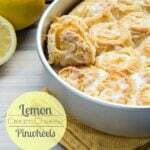 Combine the powdered sugar and lemon juice in a small bowl, whisk until smooth. Add more lemon juice if you would like the glaze thinner. Brush on top of each muffin, and let harden. You can use extra greek yogurt in place of the sour cream. Hope you enjoy the muffins! When I grow up, I want to live inside this plush little muffin! I like learned behaviors like lots of pie and muffins. YUM! 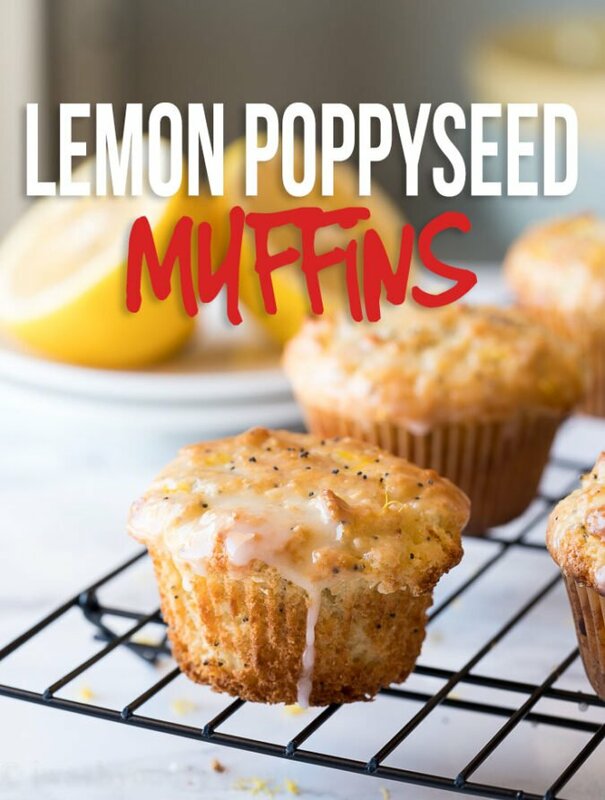 We love lemon poppy seed anything! YUM! These look so good! Perfect for summer! Lol, I totally go through random obsession periods too!! 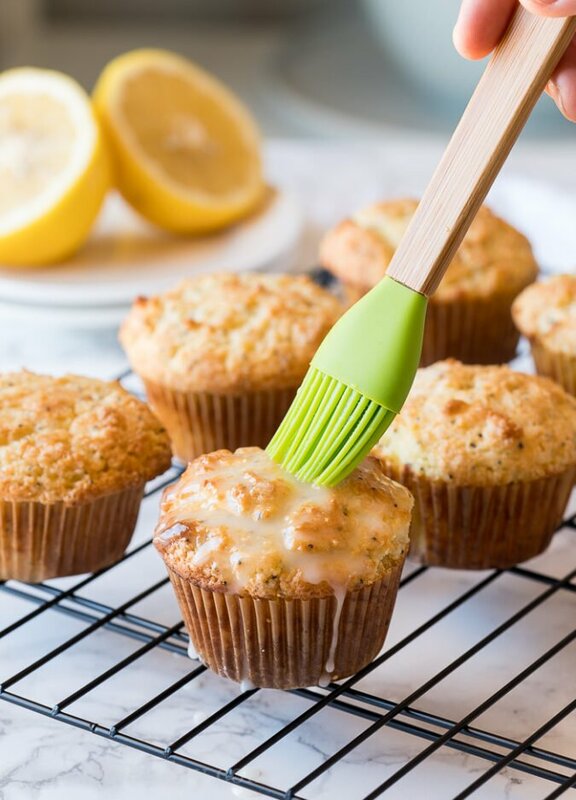 And these muffins look like they may start a new one…love!